Lorraine Vogel Klerman, Dr.P.H., Professor and Director of the Institute for Child, Youth and Family Policy at the Heller School for Social and Policy Management, Brandeis University, passed away on August 26 at the age of 81 due to complications of cancer. Dr. Klerman was a pioneering health services researcher with a particular interest in health delivery systems for economically deprived women and children. In 1965, Dr. Klerman began her research on adolescent childbearing while in the Department of Epidemiology and Public Health at Yale School of Medicine. She and her colleagues studied one of the first comprehensive service programs for school-age mothers, the Young Mothers Program. The program was a collaborative effort of the Yale-New Haven Hospital, the New Haven Board of Education, and the local anti-poverty agency. Supported by the federal Children's Bureau, this landmark study resulted in many journal articles and a book, School-Age Mothers: Problems, Programs, and Policy. While Dr. Klerman continued to study the problems associated with adolescent sexuality, pregnancy, and parenting, she broadened her field of interest to include child welfare issues. When she returned to Yale in 1984, she began teaching maternal and child health. Her research interests expanded to other aspects of maternal health, including prenatal care and family planning, as well as other aspects of adolescent health, particularly school absenteeism. She then served as a consultant to the Institute of Medicine Committee on Low Birthweight and as a member of its committees on prenatal care and unintended pregnancies. She also served as a member of many expert panels that produced influential research and policy reports. Among these were the Public Health Service's Expert Panel on Prenatal Care, the Carnegie Corporation of New York's Task Force on Meeting the Needs of Young Children, the Institute of Medicine's Committee on Perinatal Transmission of HIV, and the recent Task Force on the Consequences of Unintended Pregnancies (The National Campaign to Prevent Teen and Unplanned Pregnancies), which she chaired. While at Yale, she also completed a highly influential monograph, Alive and Well? A Research and Policy Review of Health Programs for Poor Young Children, for the National Center for Children in Poverty. In 1992, Dr. Klerman was recruited to the University of Alabama at Birmingham, to become the founding Chairperson of the Department of Maternal and Child Health and served as Associate Director of the Robert Wood Johnson Foundation-funded project,""Smoke-Free Families;" Co-Principal Investigator of the Mother and Family Specialty Center, an innovative and culturally-grounded approach to prenatal care for low-income women funded by the federal Agency for Health Policy and Research; and director of the evaluation of Birmingham's Healthy Start project. Dr. Klerman also was a founding member of the National Centers for the Prevention of Child Neglect, which recently completed two multi-site longitudinal studies of adolescent mothers and mothers at high risk for neglectful parenting. Lorraine Klerman’s grasp of the complexity of entrenched poverty of the lives of young parents – both mothers and fathers – contributed to major national efforts to help parents become more aware of the value of adequate spacing between pregnancies to improve both the mother’s health and that of her children. She also was an active member of an NIH community-university-partnered research network engaged in studying the biosocial effects of parental stress prior to conceiving a child. At the Heller School at Brandeis University, Dr. Klerman was the recipient in 2010 of the Mentoring Award. Dr. Klerman has mentored hundreds of students in public health, many of whom are now leading pediatricians, psychologists, nurses, health economists, and health systems analysts. Lisa M. Lynch, Dean of the Heller School, said, "Lorraine was a gifted and prolific scholar. Not content with just publishing her papers in the top academic journals, she spent her career putting the best knowledge on maternal and child health and welfare into practice. She was a dedicated and selfless mentor to scores of Heller students over the years. Setting high standards for her students and colleagues alike, she enriched all of us and her loss will be hard to accept." Dr. Klerman published extensively in professional journals and books. She was a graduate of Cornell University and received her doctorate from the Harvard School of Public Health. In 1993 she received the J. Roswell Gallagher Award of the Society for Adolescent Medicine and in 1996, the American Public Health Association's Martha May Eliot Award (the highest honor in the field of maternal and child health) for exceptional health services to mothers and children. Dr. Klerman was married to Dr. Gerald Klerman (deceased in 1992), a psychiatrist who served as head of the Alcohol, Drug Abuse and Mental Health Administration under President Jimmy Carter from 1977 to 1980. They had four children, Jacob, Elizabeth, Daniel, and Karen, all of whom survive her. She also leaves eight grandchildren. 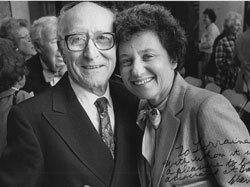 Contributions may be made in Dr. Klerman's memory to the Institute for Child, Youth and Family Policy Fund at the Heller School for Social Policy and Management, Brandeis University, Office of Development, 415 South Street, MS 035, Waltham, MA 02454.